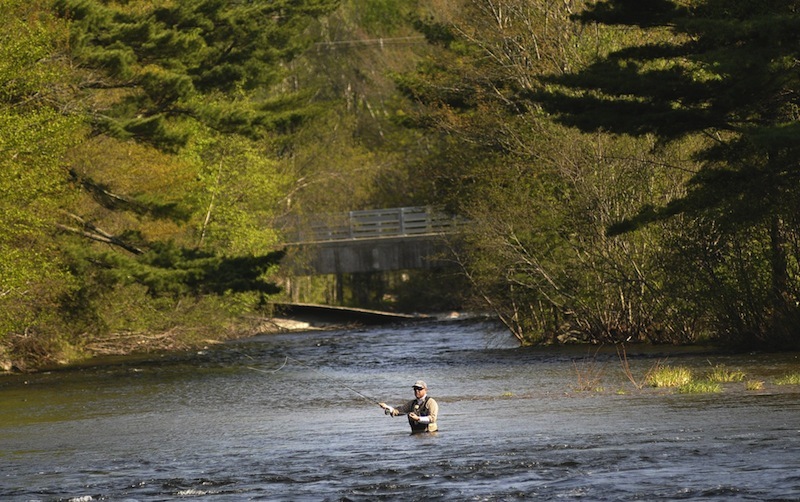 The Maine Department of Environmental Protection has again missed critical deadlines and cost the state its authority to set terms in the federal relicensing of dam projects, raising concerns for environmentalists and at least one key lawmaker. Maine now has no say over the terms of the 25-year licenses for two storage dams and two dikes that control water levels and flow in Grand Lake and Sysladobsis Lake in Washington County, one of Maine’s premier areas for landlocked-salmon fishing, and a dam at Forest City Township, on the Maine-New Brunswick border. The dams are owned by Woodland Pulp LLC, which uses them to store and release water that generates power at the paper company’s Grand Falls and Woodland dams downstream. Dam relicensing is a federal issue, but states can dictate terms on water quality issues — including seasonal water levels affecting recreation, fish spawning and fish passage — under a provision of the federal Clean Water Act. By missing two March 2 filing deadlines, the DEP irrevocably waived its authority over the dam relicensing in Washington County. In an interview, Bergeron said the development, while regrettable, will have no adverse effects because the state has not had concerns with how the dams are operated or with water quality and the health of fish in the affected lakes. He said he was unaware of any concerns among fishermen or other groups with an interest in the lakes. “The net effect (of the missed deadline) on the ground would be zero,” Bergeron said. But Sen. Jim Boyle, D-Gorham, a co-chairman of the legislative committee that oversees the DEP, said he is concerned about the missed deadlines. ‘WHO IS MINDING THE STORE’ AT DEP? 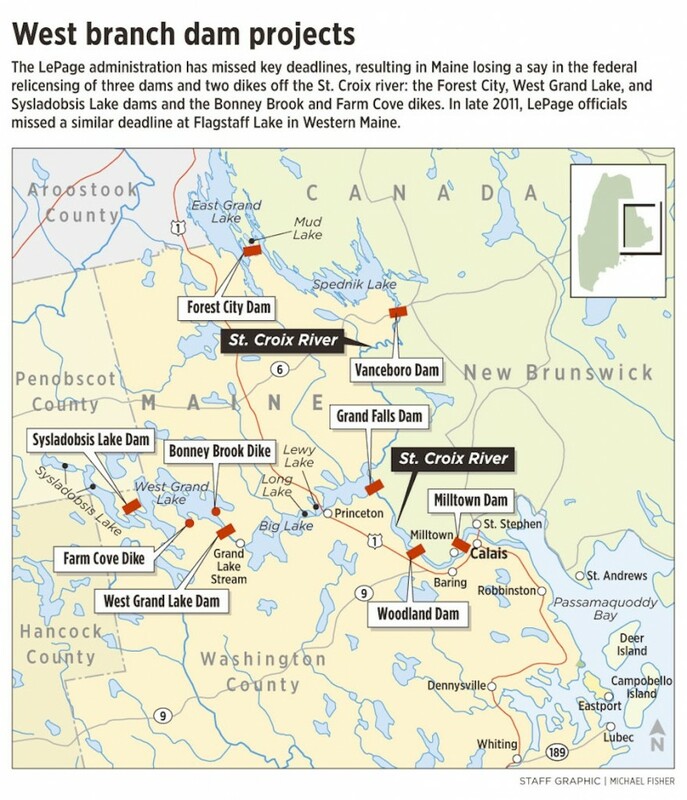 In November 2011, the DEP lost its authority over the terms of the relicensing for the dam controlling Flagstaff Lake in western Maine, where low water levels in the summer have led to dust storms and wreaked havoc on the tourism economy of Eustis and other lakeside communities. At the time, a DEP spokeswoman claimed that the missed deadline was an accident, “something that was lost sight of during the transition of leadership” in the department. But internal documents and the recollections of key staffers subsequently revealed that DEP Commissioner Patricia Aho and other key officials had been fully and repeatedly informed about the dam and its deadlines. DEP emails showed that Aho, who previously was a lobbyist with the Pierce Atwood law firm in Portland, had even met with the attorney for the Flagstaff dam’s owner, her former Pierce Atwood colleague Matt Manahan, who briefed her on the issue. DEP staff members at various levels subsequently got reminders of the impending deadline, including one the day before the Nov. 15 deadline from Assistant Attorney General Jan McClintock alerting them to the situation and its ramifications. No action was taken. Manahan has represented Woodlands Pulp LLC — formerly called Domtar — in the Forest City and Grand Lake-area relicensing proceedings at least as recently as November 2011. He did not respond to an interview request. A series of stories in the Portland Press Herald and Maine Sunday Telegram, published June 16, 17 and 18, revealed that Aho had stifled laws and programs she had been paid to defeat as a lobbyist. Aho was nominated to her post by Gov. Paul LePage in mid-2011. Jeff Reardon of Trout Unlimited, a national fish conservation group, said he hasn’t followed the relicensing of the dams in the Grand Lake area, but the missing of critical deadlines raises serious concerns about how the DEP is being managed. “I don’t know if there are any significant controversial issues here, but if there are, the DEP has lost their ability to control them,” Reardon said. Reardon said that, to his knowledge, Maine never missed a dam project water certification deadline before Aho became DEP commissioner. Forest City and the Grand Lake dams are separate projects, so the department has now missed three. Two dams and two dikes are in Woodland Pulp’s West Branch Storage Project: the West Grand Lake Dam, Bonney Brook Dike, Farm Cove Dike and the Sysladobsis Lake Dam, all in unorganized territories near the village of Grand Lake Stream on the west branch of the St. Croix River. The Forest City dam spans the U.S.-Canada border on the main branch of the St. Croix, more than an hour’s drive north of Grand Lake Stream. In an interview, Bergeron and DEP hydropower coordinator Kathy Howatt said that, before missing the March 2 deadline to submit paperwork to renew the state’s authority, they got no last-minute warning from the state Attorney General’s Office. Bergeron said his division was understaffed and that he and Howatt were overwhelmed by another project: assembling documents related to a disputed Sebago Lake weir for the Maine Supreme Judicial Court. In a written statement, the DEP said the commissioner’s office did not learn of the mistake until mid-June. Howatt said the department has not missed any other dam licensing deadlines. The next one is in February, when the DEP must file paperwork to extend its certification authority over the relicensing of the Brassua Dam, west of Moosehead Lake. Dams in the Vanceboro, Buxton and Ellsworth areas are in earlier relicensing stages. Although the terms of the new licenses will remain in force for a generation, the proceedings have had a low public profile in the area. When FERC held a public hearing on the relicensing in nearby Baileyville in 2009, not a single member of the public attended, the one-page transcript of the hearing shows. Jeff McEvoy, a master guide and owner of Weatherby’s Sporting Camps in Grand Lake Steam, said Woodland Pulp has generally done a good job managing water levels in the area, although he would like to see higher minimum water levels in winter to protect nests of landlocked salmon.